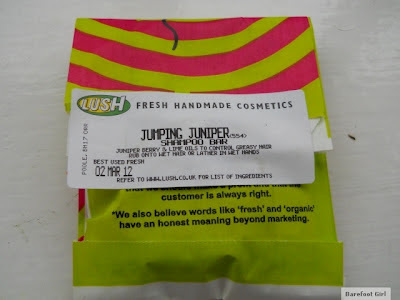 Some time ago I reviewed Lush's Solid Conditioner Bar "Jungle", which I wasn't really that impressed with. It wasn't so much that I didn't like it, but more that I was never convinced that I was using it "properly" or that I was actually getting any product on to my hair! Nevertheless, on a trip to Lush (which is actually a good few months ago now!) I'd decided that I wanted to give the shampoo bar a try, out of pure curiosity more than anything. So I went in, sniffed them all, and amazingly, the one that I liked the smell of the most, was in fact the one that suited my hair type the most. Pure luck, I say! I have to confess that I wasn't really that optimistic about this product, but I really wanted to give it the benefit of the doubt. The first scent that stood out for me, when I initially smelt it was definitely the smell of Lavender, so it surprises me how much I quite liked it because I've never been a fan of Lavender. But the scent isn't entirely Lavender, and there are underlying smells that aren't that nice, but after 'The Jungle', I'm not hugely bothered by the smell. As with the Jungle Solid Conditioner, this looks like your typical bar of round soap! There's no design on this one, however, instead it's quite plain, whilst the surface is quite rough in texture. I had an absolute nightmare trying to use the Solid Conditioner; it didn't later at all, and I never felt like I was actually putting any product in my hair no matter how I rub it or dragged it through my tresses. I've, to this very day, still not mastered how to use a Solid Conditioner and don't think that I will ever get used to it. "Rub onto wet hair or lather in wet hands"
Now, after the rubbish of the Conditioner you'll excuse me for taking this with a pinch of salt, but I played along and attempted to lather it up in my hands. And you know what? It actually worked. It lathered up in my hand and yes, yes I did get a little too there's-a-face-of-Jesus-in-my-soap-type-of-excited!! By lathering up this is already a million steps ahead of the Conditioner, however despite the fact that this was suited to my hair type, I'm not really convinced that it did anything for it. Yeah, it was clean but it was also knotted which was a bit of a pain in the bum. Other than the lathering up, the only other thing that saves this for me, and make me "sort of" interested in buying it again, is the smell. I know that I hadn't been keen on it initially, but when the wind is blowing my hair and it wafts across my face there is something so lovely about the scent of the Juniper in this product. It's such a refreshing and light smell, that doesn't feel overpowered by chemicals. I'm in two minds about this. I do like the product, and as long as my hair is clean does it matter about if I have to attack my hair with the Tangle Teezer after using it? I do like the smell, and the fact that it lathers hurrah! It has also lasted me for absolutely ages, but then I don't use it very often. But in the longevity sense it's worth the money. 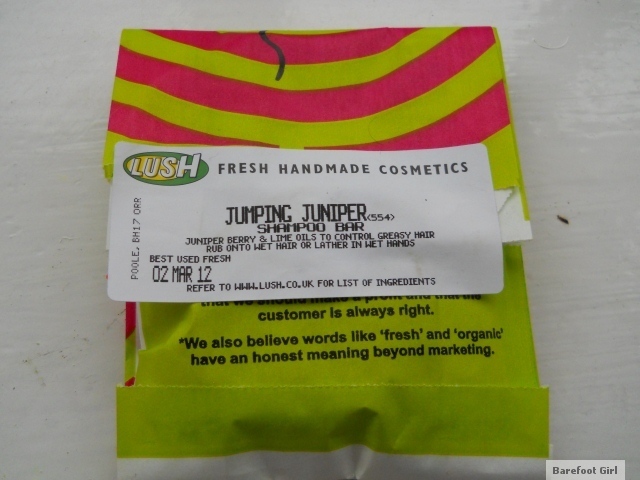 Have you tried Lush's Jumping Juniper? What do you think? I've never tried Lush products before - not really a fan and the smell is so strong before you enter the shop. Though they do have such cute soaps sometimes!